So, aside from using Twitter, what else can we learn from her story? She says the answer isn’t to never check your baggage – that’s just unrealistic, especially when going on multi-week vacations. But when you do need to check your luggage, make sure to carry on your valuables and all essentials such as travel documents, medication, contact lenses, and maybe a change of underwear. Another tip she gave was to share luggage with your spouse – in other words, don’t put all of your stuff in your own suitcase and all of your spouse’s stuff in his/her suitcase. 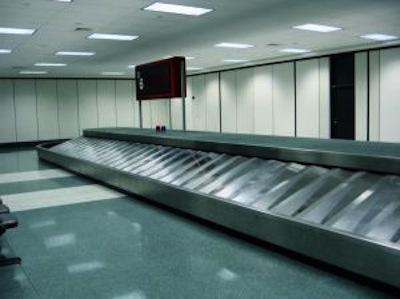 The odds that just one of your bags will be lost is much greater than both of your bags getting lost. And finally, if your luggage does go missing, don’t forget to get your “file locator number” from the airline when you file your report. * US Airways temporarily lost a suitcase of mine during a trip to London many years ago. Since I wanted to be comfy during the long flight, I was wearing sweatpants, Uggs, and a North Face fleece – not exactly the outfit I planned on wearing out in public during this vacation. Of course Aaron’s suitcase arrived fine so he was appropriately dressed, but mine wasn’t delivered until four days later! London is an expensive city and I was a grad student who couldn’t afford to just go out and buy several new outfits, plus the airline kept promising that my suitcase would be delivered “soon” and I naively believed them. Needless to say, I definitely did not look my best during the first half of that trip, and no I will not post any of those photos on the blog. However, I refuse to fly while wearing sweatpants now.